Symi This is mainly a rocky island, except for its southern part which is covered with pines, mulberries and fruit-bearing trees. Symi is located in the Southern Dodecanese, north of Rhodes and close to the coast of south-west Turkey. The island is just over 13 km north/south and about 8 km east/west with an area of some 68 square km. 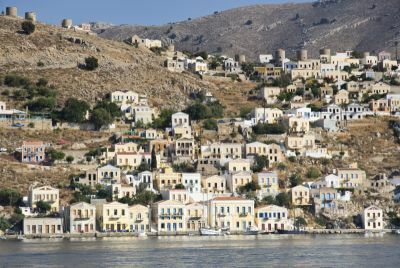 Symi is divided into distinctive areas - Yialos is the main harbour. Chorio, literally 'village', is the top town. Pedi Bay is the valley below Chorio, south of Yialos. Nimborios is the bay and settlement to the north of Yialos. There is a small settlement at Marathounda and a major Monastery complex at Panormitis. "Center video of the surf center located in Ixia Rhodes Greece"